You need a resume strategy just as you need a sales strategy. Check out this sales director resume sample for guidance on how to improve your resume. Looking for sales director jobs? You know how important a strategic plan is to any sales operation's success; a strategic plan for your resume is just as important, says resume expert Kim Isaacs. 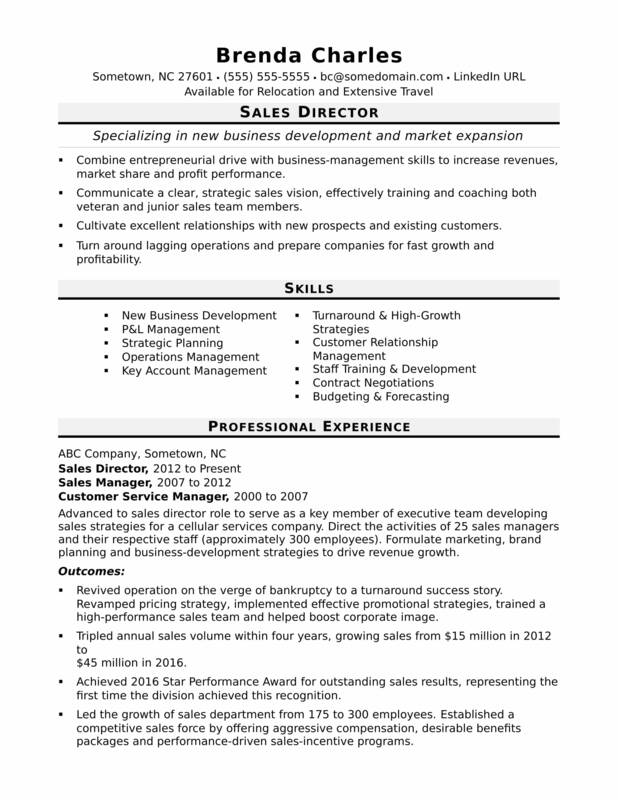 For guidance on how to plan your resume's strategy, check out this resume sample for a sales director that Isaacs created below, and download the sales director resume template in Word. Jobs for sales directors are projected to grow by 7% (or 28,900 jobs) from 2016 through 2026, according to the Bureau of Labor Statistics (BLS). You'll find the highest level of employment for this job in the following states: California, Texas, Illinois, New York, and Florida; and in the following metropolitan areas: New York City, Los Angeles, Chicago, Atlanta, and Boston. As a sales director, you can expect to earn a median wage of $121,060 per year, or $58.20 per hour, according to the BLS. Additionally, you can learn more about sales careers and search for sales director jobs on Monster. Combine entrepreneurial drive with business-management skills to drive gains in revenue, market share and profit performance. Communicate a clear, strategic sales vision, effectively training and coaching both veteran and junior sales team members. Cultivate excellent relationships with new prospects and existing customers. Turn around lagging operations and prepare companies for fast growth and profitability. Advanced to sales director role to serve as a key member of executive team developing sales strategies for a cellular services company. Direct a team of 25 sales managers and their respective staff (approximately 300 employees). Formulate marketing, brand planning and business-development strategies to drive revenue growth. Revived struggling operation from being on the verge of bankruptcy to a turnaround success story. Revamped pricing strategy, implemented effective promotional strategies, trained a high-performance sales team and helped boost corporate image. Tripled annual sales volume within four years, growing sales from $15 million in 2008 to $45 million in 2011. Achieved 2011 Star Performance Award for outstanding sales results, representing the first time the division achieved this recognition. Led the growth of sales department from 175 to 300 employees. Established a competitive sales force by offering aggressive compensation, desirable benefits packages and performance-driven sales-incentive programs. Improved sales policies and practices. Defined the sales cycle, created accurate job descriptions and developed standards for customer relationship management. Provided consultative sales of pagers and cellular phones to corporate accounts. Prospected for customers through cold calls, referrals and networking. Qualified leads, negotiated with corporate customers, closed deals and managed accounts. Closed an average of 35% of all leads and achieved between 110% and 120% of projected monthly sales goals during tenure. Targeted and penetrated a competitive market. Sold thousands of corporate accounts and converted many customers from competitors’ services. Recognized as a member of The Shining Star Club for routinely exceeding quotas. Established relationships within a Fortune 500 company and guided sales representatives to close deal generating $125K in recurring annual revenue. Orchestrated successful promotional campaigns, including a special offer that penetrated market territory by 6% in one day. Can your resume close the deal? As a sales director, you're familiar with the power of a great presentation. Your resume has the same ability—if it's strong enough, it can help close the deal on a new job. Not sure your resume is quite there yet? Get a free resume evaluation today from the experts at Monster's Resume Writing Service. You'll get detailed feedback in two business days, including a review of your resume's appearance and content, and a prediction of a recruiter's first impression. The experts at Monster have as much experience with resumes as you do with sales, so let them help you get some buy-in from hiring managers.